In the aftermath of the horrific and senseless terrorist attacks on Paris on November 13, 2015—in which so many innocent lives were taken at that evening's Eagles Of Death Metal show at Le Bataclan—it was none other than Duran Duran who reached out with an immediate and sincere act of musical solidarity: In response to a fan-led campaign to push Eagles Of Death Metal’s cover of Duran Duran’s classic “Save A Prayer” to #1 in the UK, Simon LeBon tweeted that the new romantic icons would donate their share of royalties from the track to charity. 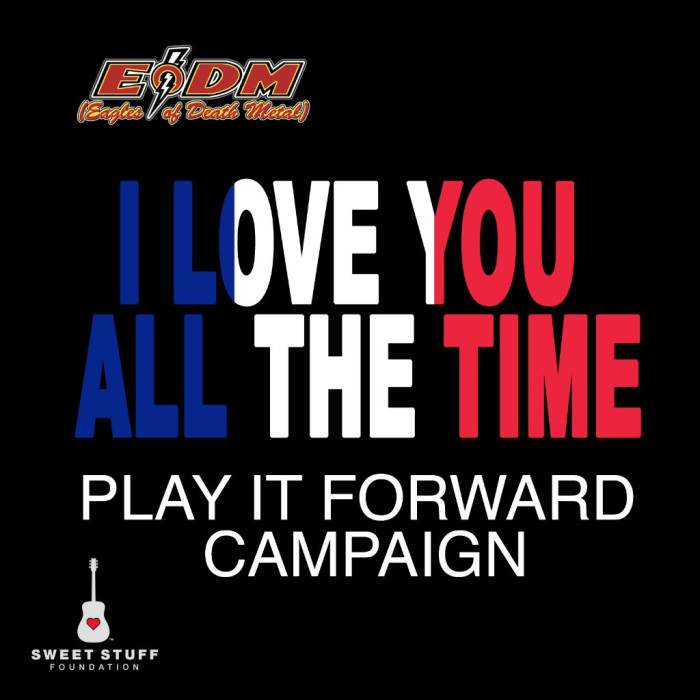 In the weeks that followed, Eagles Of Death Metal asked its musical family to extend the victims of the Paris attacks the same kindness and compassion that everyone from the members of U2 to the French authorities had shown the band—to join the Play It Forward EODM Campaign. EODM asked artists the world over to cover “I Love You All The Time” from its current album Zipper Down. For every cover sold, the band pledged to donate 100% of its publishing income to The Sweet Stuff Foundation, the non-profit organization founded in 2013 by EODM co-founder Joshua Homme to provide assistance to musicians and their families in times of need, as well as musical education and gear for the next generation. Participating artists were also asked to donate the money generated from sales of the song to the charity. Extending their appreciation beyond their fellow musicians, Eagles Of Death Metal thanks Amazon, Apple, Spotify and TuneCore Distribution for joining the Play It Forward initiative in donating their proceeds from these covers to Friends of Fondation de France in participating markets. Homme commented on the Play It Forward EODM Campaign and this first showing of camaraderie: "I made a plea to artists and business people alike to come together to use our solidarity as proof that we are stronger together, and that we can make a difference. We are proud to be a little part of such a big group of talent and good will. We can’t thank these artists enough for their donations of talent, love, time, and compassion. Now, the Play It Forward Campaign is in the hands of the fans to help us make a difference, and to help those affected by this tragedy. Please listen, purchase, play, and enjoy – and know that every time you do, you’re doing the sweet stuff that makes that difference." Additional versions are forthcoming and will be announced as they are confirmed. Those wishing to donate should go to playitforwardeodm.com for information on how to do so. The covers are available today on iTunes, Prime Music and Spotify. Additional versions are forthcoming and will be announced as they are confirmed. Those wishing to donate should go to http://playitforwardeodm.com/ for information on how to do so. With cooperation from Foundation de France: www.foundationdefrance.org and FENVAC www.fenvac.org, Play It Forward EODM Campaign donations to Sweet Stuff will aid the surviving family members of those killed in the November 13 Paris attacks—as well as the family of slain EODM crew member Nick Alexander. For more information on The Sweet Stuff Foundation, go to thesweetstufffoundation.org.